Meet our dynamic owner and operator Dominic Bianchini. In 2008 Dominic started hauling for friends and neighbors to make extra money while in high school. He always felt the importance of recycling his loads or donating to local charities. He had great concern for the environment, the increasing pollution in our region and the wrong waste going into our landfills. After completing college, Dominic returned to Novato where he worked in the food industry. Even with a full time job, Dominic continued hauling jobs on his days off with even more diligence and knowledge of recycling. Fast forward to 2015, Steve and Deborah Bianchini, having been retired for 5 years, observed with pride their son Dominic’s excellent work ethic and saw the potential in his “side” business. Together as a family, they collaborated and decided this was a business venture they would like to help him grow and take to the next level. Dominic already had the long time passion and the new company would be based on excellent customer service, taking pride in recycling, donating, giving back and leaving each job with very happy and satisfied customers. 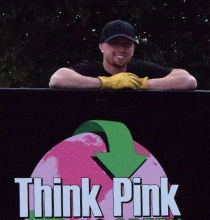 In January 2016 Think Pink & Green - Junk Removal and Hauling – officially opened for business! It is a fully insured, licensed and bonded company with a headquarter in Novato though serving the entire Bay Area. No longer just a pickup truck and trailer, they added to the fleet a 16 foot-dump truck and a 14 foot-enclosed box truck for the furniture and re-usable items. They also have large Sprinter van for smaller jobs. Think Pink and Green has been blessed with remarkable growth, very positive feedback (see our 5 star-Yelp reviews!) and already returned clientele.